Snoil – Ferrofluid Display | OhGizmo! Ferrofluid is basically microscopic magnetic particles suspended in a soapy-like liquid that has the appearance of black sludge. However when a magnetic field is applied the liquid seems to come to life and forms some truly remarkable shapes. You can see a video of Ferrofluid in action here and I guarantee after watching that you’ll be running out to your local science store trying to find a bottle of this stuff. Martin Frey, a student at the Berlin University of the Arts has developed a grid of computer controlled magnets that can produce dot graphics in a shallow container of Ferrofluid. This in turn can be used to create simple animations (scrolling text) or in a slightly cooler application used to interactively play the old SNAKE game. The direction of the snake is controlled by tilting the box itself and this motion is translated to the game VIA internal gyros. 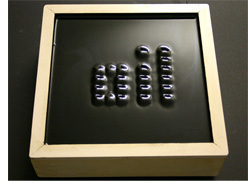 A video of the Ferrofluid Display including how it works and what’s inside is available here. Does anyone else see the potential of using this as a dynamic braille display? If this is solid enough to touch, I could see this being used in a braille web browser, where blind users can browse site’s text one lines at a time.